Ta Prohm temple was constructed in 1186 AD at the end of 12th century, by king Jayavarman VII. He built this temple to dedicate to his mother (Jayashitamani), also to serve as a Buddhist temple. Ta Prohm ( Which mean Old Brahma) was just a new name, according to an inscription, the original name was Raja Vihara meaning "The Royal Monastery". 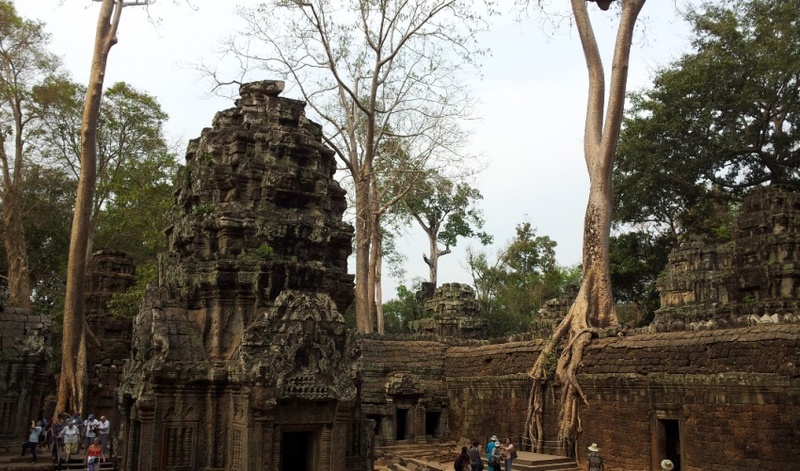 Ta Prohm temple also is the one of the massive temple complexes in the Angkor area. 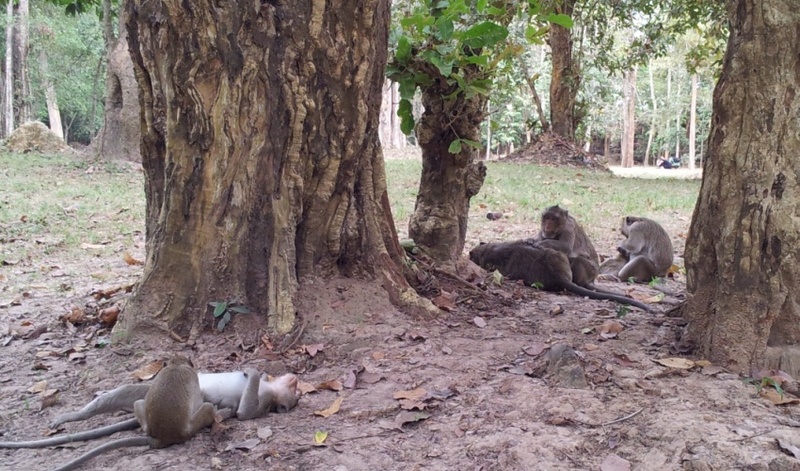 Any one has arrived in Ta Prohm will find out by themselves with a feeling of mysterious, amazed and romantic. 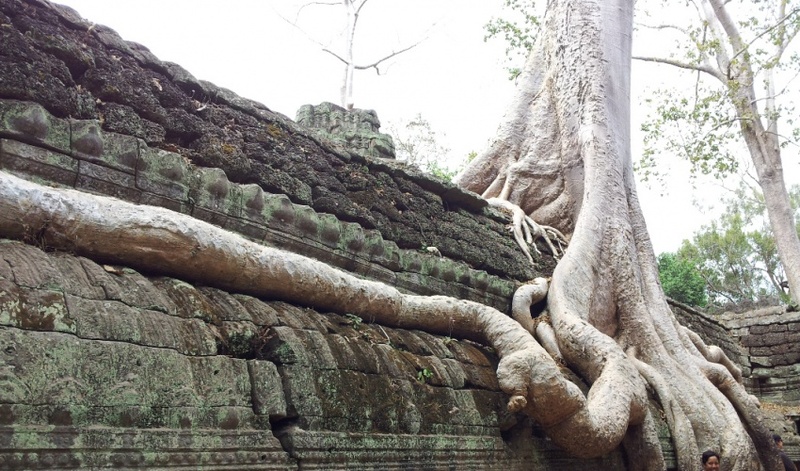 Because Ta Prohm comprises the special characteristic of a nature take over the ancient temple by the giant trees, and have no any idea to restore too much, despite Indian government has a restoration and preservation project on the site. 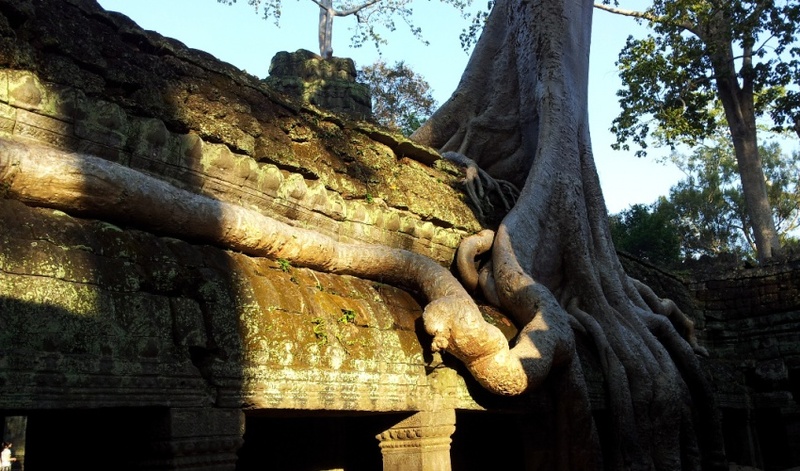 There are many big trees still allow to grow on the temple building for making the visitors to understand how the temples in the Angkor area liked after four to five hundred years had been abandoned. Also for making us to appreciate the restoration works with the big jigsaw puzzle done by the French over 100 years ago at any temple sites, since they took to control Cambodia as their colony. 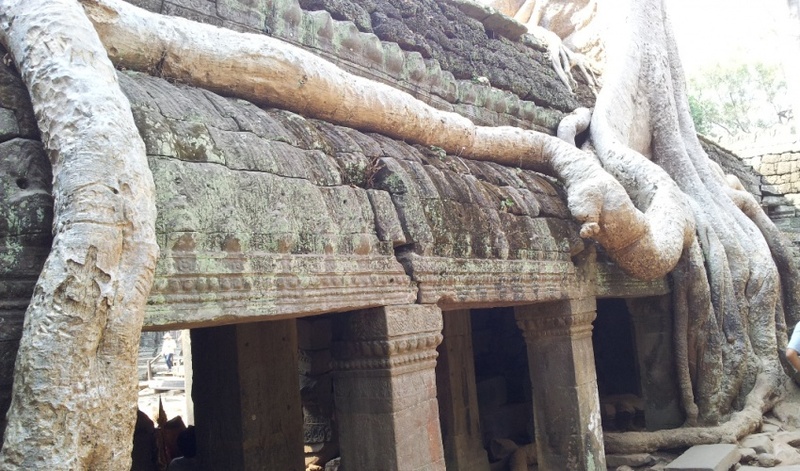 We also have noticed that king JayavarmanVII began to build Ta Prohm immediately, when he just finished his very first Banteay Kdei temple for his teachers within five years of time only. 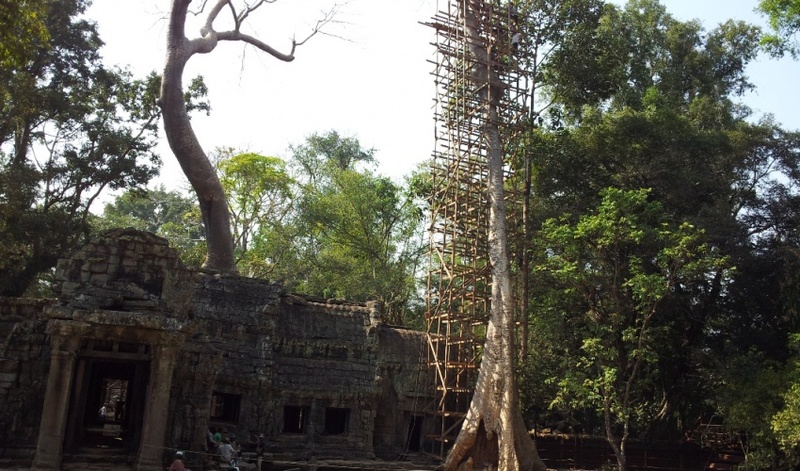 For Ta Prohm the king also put five years project to complete. Because the king needed to have more time for other projects. The outer wall of Ta Prohm has a measure of 600m X 1000m. Along with this enclosure, there is one Gopura construction on each side. In each Gopura decorated with gigantic faces of Lokesvara on the top, and angels doing a pray at surrounding the holy faces, then comes with a Garuda statue stepping on Nagas with holding Naga's tails in order to show off his power to protect lord Lokesvara. The compound between the outer wall to the inner wall, originally used to be the dwelling of many thousands people who were the servants of the temple ceremonies living. But since the abandonment after the war with the enemy in the 15th century no one was living take care and preserved that was the good chance of the jungle took over grown , and this jungle now is protected from chopping down. The second entrance is represented to the world of earth, while the first entrance is represented to the underworld. The building of the second entrance which constructed combination between sandstone and laterite (from the west side) is collapsed and leaning. The broken condition was about 80% destroyed by the vandalism and only 20% happening by the nature. 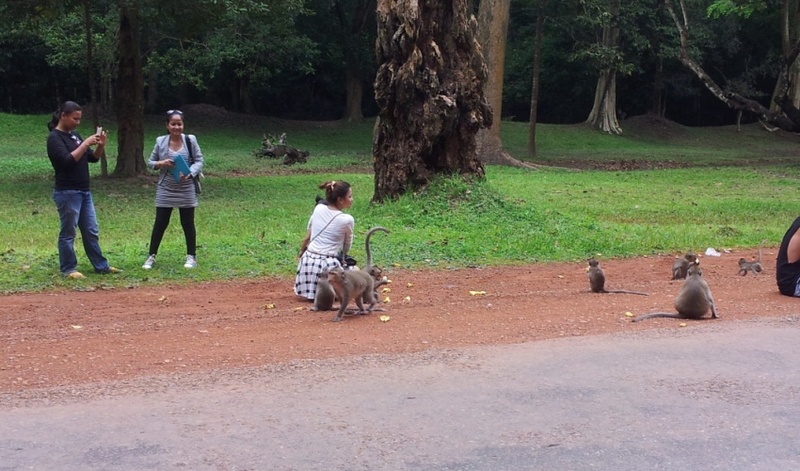 At the second entrance there is a moat surrounding the laterite wall measured of 160m X 300m. The moat get water just at the end of the rainy season only, the rest of the time it is dry out. The moat and the second enclosing wall were separated between the dwelling of the man and the dwelling of the god. A sandstone causeway about 30m long is crossing the moat to the second entrance, however the floor of the causeway is uneven since the roots and vandalism challenge its position, but appreciation the nature of un-restoration temple competition with the giant trees altogether. Crossing from the second entrance, then there is another stone causeway measured of 70m long which now under restoration project from Indian government. This causeway known as the second cause way for leading to heaven from earth. Notable the giant Spung (name of the three or mean Capork or cotton tree) grows so gorgeous for about 500 years old near to the second entrance building and the second causeway. This tree at the moment people called “Tree of Hanuman Face mean monkey ”, because since at its trunk there is a hole shaped like the hunuman face, then served as a place for put our face into the hole to take picture for fun. Many people put the trees as a big destroyer to the temple, as did not think the tree and temple are symbiosis system, that is why the area that Spung trees are growing the temple building still standing, some idea claimed the corbel arch was not strong to hold the building , actually the temple collapsing were vandalized by the enemy when they occupied Angkor before king Ponheayat liberated back in 1393 AD. Then the king decided to abandon the Angkor in 1431 AD when the city’s infrastructures included the temples had been destroyed by jealousy. Before we arrive at the temple complex from the west side, we had passed through another moat (second moat) and another laterite wall (third wall). To have different moat and different wall in the temple complex, it’s symbol the replica of cosmology which the world consists oceans (moat) , mountains (wall) and continents ( courtyard). Then the first temple cloister (gallery) appearing at the measure of 80m X 180m. But the building of this cloister had been destroyed during the enemy’s invasion in the 14th century as using the elephants pulled over, otherwise the building would not have any problem because they built of the solid stone material. Notable, on the wall of this cloister used to have Buddha images in a meditated position, but the holy images had chopped off in the 13th century when the builder great king Jayavarman VII had died, then his successor ( Jayavarman VIII ) was not a right ruler too extreme Shivaist then ordered his followers to remove all Buddha images from the Buddhist temples in around the Empire. That is why on the wall was empty remaining just the protected naga images. The second gallery measure of 50m X 90m, built with two materials sandstone and laterite altogether served as a place to meditate and religious ceremonies. In this section, there are many giant trees growing to impress the visitors. All the visitors feel so interesting to see the huge trees grow so powerful on the temple building. The trees started to grow on the roof first, trees are able to grow because on the stone there are thick mosses germinated, then the mosses provided moisture and nutrition to all plants to grow, when the plants are getting bigger and bigger they sent the roots to the ground for absorbing water by themselves and take over the temple. When trees grow on the temple they always sent their roots to hold the building on the both side, so that mean when the trees still alive the trees and temple building support each other. Trees not always grow with the seeds, they germinated with the rich combination biology due to the weather and climate of the region, that is why in the jungle of the Angkor city there are bout hundred different kind of plants and vegetations grow. Ta Prohm comprises another gallery built of sandstone, this gallery known as the third gallery circling around the central tower. On the niches of this gallery, there are beautiful and intact apsara sculptures, and at inside the chambers were the houses of the holy status. The central tower of Ta Prohm originally was the house of a bronze statue of king's mother in a guise of Pranjabaramitta facing to the east. On the wall of this prasat, notable a lot of uniform holes. These holes were made in order to fix the copper plates onto the walls till the ceiling level and for put the crystal for a rich decoration in the most important chamber of the temple sanctuary. Those artifacts now had stolen in the same time with the sacred statue of king’s mother during a war period when Siamese invaded Angkor in the 14thcentury. We notice that in each Khmer temple, at underneath of the statue used to burry the treasures, holy relics and the golden urn. Particularly, bronze statue of king's mother at the central tower of Ta Prohm and other treasures included her ashes in the golden urn had been tooted. It’s remaining just the stone pedestal, during the time of looting, the smugglers had moved the statue base from its spot in the middle to west side, so that they were able to collect the treasure. Ta Prohm has 36 sandstone towers (some say 39 towers), but 36 is more likely right since in the Buddhist myths had mentioned about 36 paradises (Thann Tritreung) where a place for Buddha's mother (Sirimahamaya) living, when she passed away, one week after she given birth to lord Buddha. The other reason with the 36 rather than 39 has been mentioned in the property list of the inscription on the precious stone as well. From this explanation, that is why the 36 towers are much more significant than 39, because the 39 we cannot find any significant. By the way, Ta Prohm was a temple constructed to honor of the king’s mother, since mother of Buddha living in 36 heaven, thus king's mother also had to live in 36 temple towers liked the 36 heaven of Buddha’s mother as well. Therefore, Ta Prohm is represented to 36 heavens located on earth. Until we reach at the central, we had passed by six enclosing walls coming with a concentric position. Among six concentric walls, there are three designed as rampart built of laterite, while three more enclosure walls built as gallery or cloister in a maze interconnection chambers. The tip of Ta Prohm Prasat ( temple ) had vandalized. 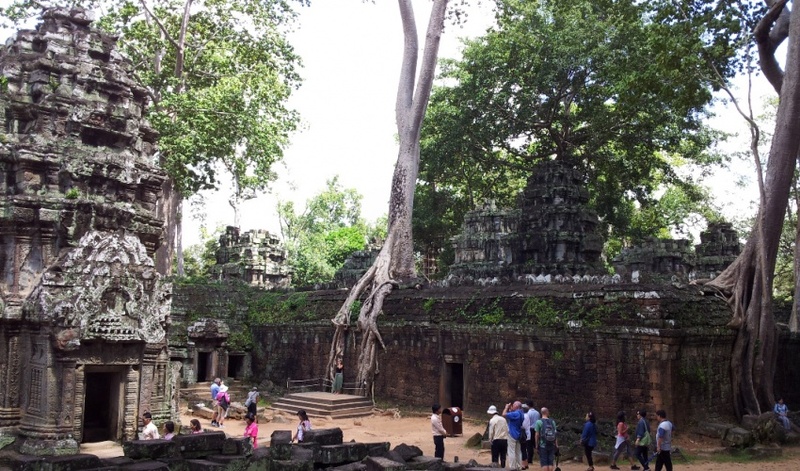 The destruction of Ta Prohm temple at the tower tip for looking for the emulate golden leave. The Khmer kept the treasure relics not at the bottom of the statue pedestals but they put on the top of the towers as well. Then crossing pass the third gallery where you will see a seated position statue of Avalokesvara with a new head and then move to the second gallery building before you heading to the echo chamber. Ta Prohm temple also comprises a prasat called "Echo Chamber". Local people believed the echo chamber was a place to remove their worries away, and also for healing a mental and physical illness or otherwise to relieve their tension. To hear echo you have to lean your back against the wall either side, then beat your chest where your heart is for seven times. ( Not from your voices ) To beat for seven times because the seven is significant of 7 days of the week. The echo chamber is an interesting place to all tourists. Move from the echo chamber to the east you will enjoy the a big root which its shape look liked a giant snake then crossing the first gallery to the Dancing Hall. Talking about Dancing Hall Ta Prohm temple also got a Dancing Hall. We noticed that most of the main temple structures which constructed by king Jayavarman VII, always having a Dancing Hall liked Banteay Kdei, Preah Khan, Ta Prohm itself and Bayon so on. Out from the dancing hall, move to the east then we arrive the eastern second entrance. On the building of this Gopura, there is a magnificent Spung tree grow. This tree has so gorgeous roots which very nice for photograph. Move further to the east from the eastern second Gopura then we have a consecration terrace. There are only two lion statues survived from the looters at the consecration terrace to the southern side. But the naga balustrade completely gone. The Chambak tree (iron wood) grow on this terrace as well. Ta Prohm was a rich temple in the Angkor period. An inscription which they found at its origin spot tell us about the properties and the people of Ta Prohm temple are quite interesting. The people who Ta Prohm's inscription tells us include men and women in the 3,140 villages who sent the supplies to support the temple in each year. For the property, Ta Prohm temple owned a golden bowl weighted 500 kg and as the same as a silver bowl weighted with 500 kg as well. Inscription tells us Ta Prohm owned precious stone include 36 pieces of diamond, 36 pieces of ruby, 36 pieces of sapphire, 44,620 pieces of pearls and 4500 pieces of all kind of other precious stone. There were also more materials such as 512 silk beds, 523 parasols, 876 veils from China so on. know there were 18 high priests, 2740 Buddhist monks, 2202 temple coordinators, and 615 dancers so on. The inscription tells with a list of the supplies that the temple needed for the daily offerings in the temple include rice, milk, oil, and seeds so on from the 3,140 villages. There was also a list for the supplies needed in the important feasts from the Royal Treasury include seeds, milk, honey, wax, sandalwood and 2,387 sets of clothing to adorn the 250 gold, silver, bronze and stone statues. The inscription ends with saying that " Doing the good deeds, his majesty the king with extreme devotion to his mother with his prayer: that because of the virtue of the good deeds I have accomplished to my mother, ones delivered from the ocean of transmigration, may enjoy the state of Buddha". From what the inscription has mentioned, made us think, what a glorious period to the Khmer empire!, then make us a feel so proud of being descendent with the ancestors in the Angkor period. 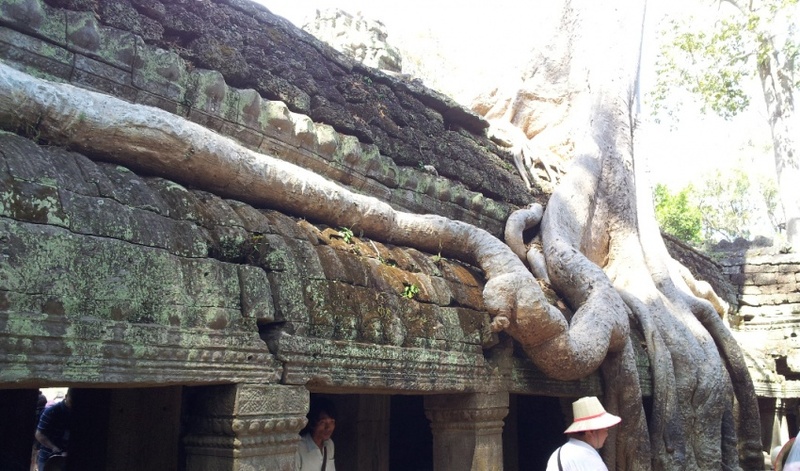 Richest property of Ta Prohm was suitable to its original name Rajavihara.